amazing! A spaceship landed in her neighbour’s back garden and some funny aliens stepped out. Then, would you believe it – they stole the red spotted bloomers hanging on their washing line! 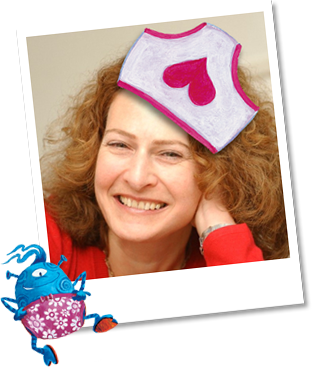 Of course she had to write about it – and Aliens Love Underpants was born! Trouble is, those naughty, but friendly aliens, do keep coming back. So it’s ‘pencil at the ready’ to write more stories about their crazy adventures. Some of Ben Cort’s favourite things are tin robots, 1960s US comics, photography, sunny Autumn days walking in the woods, being able to wear jeans and t-shirts everyday (he even wore them to his wedding!) and, of course, aliens! He sometimes creates his illustrations with paper and paints and he sometimes creates them using the computer. 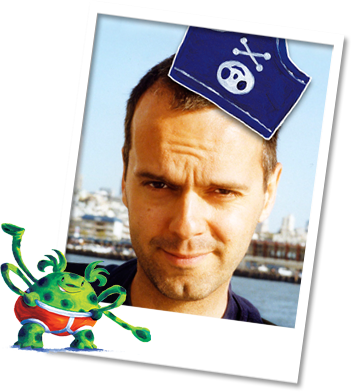 Ben does lots of fun events at festivals, schools and bookstores across the country so be sure to check the events page of this website to find out where he will be popping up next – oh and don’t forget to bring your pants!